MULTIPLUTO is a high performances compact observation ROV (Remotely Operated Vehicle) designed for very deep ocean exploration. Depth rated to 4000 meters, MULTIPLUTO is the perfect tool for ocean science and seabed imaging. MULTIPLUTO is by far the world smallest ultra deep ROV, with dimensions so compact to allow transportation in the trunk of a mid-size car. 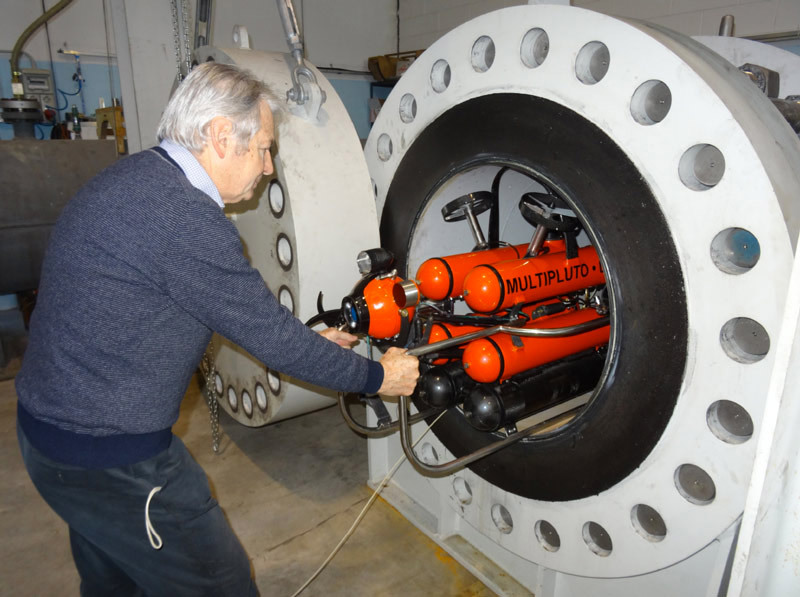 Weighing in at only 60 kg, and delivered in a fully portable configuration, MULTIPLUTO can be deployed without the need of expensive or encumbering structures even form a small rubber dinghy, thus contributing to cost reduction of the typically expensive scientific research activities. 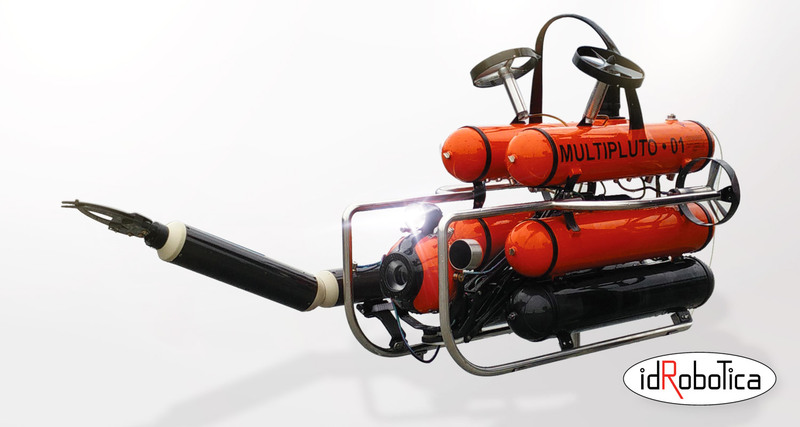 MULTIPLUTO is particularly suitable for deep underwater explorations, scientific research in the fields of biology, geology, oceanology, sampling, archaeology, wreck inspection, and object recovery which is granted by the optionally available underwater tools. In all, MULTIPLUTO is the ideal instrument for spot interventions in ultra deep missions for industrial, scientific, governmental, law enforcement, search, rescue and more. Easy launching - recovery vehicle so small weighing only 60 kg. Fast descent (1000 m in 20 minutes) using a disposable ballast. Optical umbilical cable very thin, durable, reusable, buoyant, strong. Operation mode #1: eyeball vehicle hanging on the umbilical cable, yawing and moving horizontally by remotely operated propulsion and adjusting depth by acting on umbilical cable pay out or take up. Operation mode #2: following ballast release, the vehicle acquires full ROV manoeuvrability in the water volume, taking advantage of the low drag umbilical cable only 3.5 mm diameter and slightly floatable so that it always sets above the vehicle. “Swan head”, multisensory head capable of pan, tilt and articulated neck elevation, allowing swan like all round views. Battery powered vehicle allows 8 hours average inspection time. Fast return to surface (1000 m in 20 minutes) and easy recovery. Wide range of sensors and options including manipulator arms, fish traps, sediment and soil sampling tools, laser gauge, and more. The main body is an assembly of six carbon fibres pressure resistant cylinders, four of them housing high power batteries, the other two cylinders are packing the electronics. No floatation foam is used. The “SWAN head”, a very small head movable to look all around and supported by a long articulated neck is an extremely flexible sensor package combining full High Definition TV camcorder with integral 20 Megapixel still camera and corrected viewport, a relocation-navigation sonar, LED floodlight and a laser gauge. The propulsion is based on 4 pressure compensated brushless motors in a typical PLUTO configuration, two horizontal thrusters for forward-reverse and yawing movements plus two vertical vectored thrusters for up-down and side shift. No silt is being lifted by propellers. Search and navigation sonar: 200 kHz 8°beamwidth aimed to the centre of the TV screen, ranges 120m-60m-30m, fast A-scan display for blind instrumental navigation and generating 90° wide sector maps with true compass bearing references and distances for target relocation, all sonar data are displayed on the single console screen for pilot comfort. OTHER: Responder for underwater positioning and tracking, 2000 m slant range, compass, inclinometer, depth transducer, inertial unit. Flat screen for video image and overlay of navigation data, alarms, system information, sonar displays. Two joysticks for manual vehicle driving, one lever for cable control, acoustic beeper to warn the pilot of the cable unrolling or winding up. Pushbuttons and toggles to control other functions. The pilot can choose Manual steering acting on two joysticks or to select one or more automatic controls: depth, course and speed. In this case joysticks are used to set desired automatic values and pilot hands are free. An optional computer can take full control for true robotic missions. Power converter used to recharge the vehicle batteries and as power source to the cable management drum and to the pilot console in case a 24 VDC line is not available aboard. POWER: input 100 – 240 VAC max 1600 W.
Powered drum with 2000 m of fibre optical cable,3.5 mm diameter, reinforced to 200 kg breaking strength and slightly floatable. (optional version with 4000 m) The automatic control of pulling force is adjustable from 0 to 15 kg, control can be local or from the pilot console. Metres counter of cable out. Voice communication to the console.